The Champion is classified as a slow speed masticating type machine. It chews the fibers and breaks up the cells of vegetables and fruits. This gives you more fiber, enzymes, vitamins and trace minerals. All this results in the darker, richer color of the juice and a sweeter, richer, more full bodied flavor. The Champion is simple and easy to use. Assembly doesn't require nuts, bolts, screws or clamps. Just slide the floating cutter on the shaft, make a quick half turn, the body locks on and the machine is ready to use. Remove the screen and insert the blank and it is now a homogenizer. It is so simple and all the parts are easy to clean. Assembly, disassembly, juicing and homogenizing instructions are included in the Operating Instructions book. By reading the book, you will receive the maximum efficiency and use from your new Champion Juicer. The Champion is powered by a full 1/3 horsepower, heavy duty motor. All parts are made from 100% FDA accepted nylon and stainless steel. The floating cutter has been designed to separate he juice from the pulp in a continuous operation. No intermittent cleaning is required. 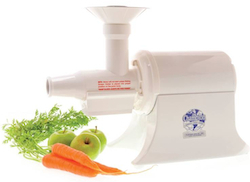 The Commercial Model Champion Juicer has a 1/3 hp GE motor, stainless steel shaft with heavy duty bearings, variable 110/220 volts, 100% nylon and stainless steel components. Best for juicing over 1 quart at a time. For maximum extraction, press the pulp with a Welles Press. This Champion Juicer, except as noted below, is warranted by Plastaket Manufacturing Company, Inc. (Plastaket) only to the original consumer or other person for whom the original consumer purchased it as a gift, to be free from defects in material or workmanship under normal use for a period of ten (10) years from the date of its original consumer purchase (date of purchase). Note: Normal wear of the cutter is covered for a period not to exceed one (1) year. Motor defects resulting from motor shaft seal failure are covered for a period not to exceed three (3) years. If there should be a defect covered by this warranty within the warranty period, Plastaket will at its election either repair or replace the Champion Juicer or defective part, free of charge, provided it is properly packaged and delivered to Plastaket. Within the Continental United States only, the freight will be paid by Plastaket for up to one year from the date of purchase, Method of freight will be at the discretion of Plastaket. This warranty does not cover loss or damage due to abuse, mishandling, alteration, accident, failure to follow operating instructions, or damage caused by parts or service not authorized by Plastaket. Plastaket will not be liable for commercial consequential or incidental damages. Since some states do not allow this limitation, it may not apply to you. Any part damaged by a cause not within the coverage of this warranty, may be purchased from Plastaket at the current list price plus freight. In case of damage during shipment of your new Champion Juicer, do NOT send the juicer back to Plastaket. Immediately report such damage to the delivering carrier and have the carrier fill out an inspection report. Contact the place of purchase for further instructions. This warranty provides specific legal rights and you may also have other rights which vary from state to state. Any communications with Plastaket in regard to this must contain the following information: (1) Your name and present address; (2) Serial number; (3) Date of original consumer purchase; (4) Name and address of the dealer; (5) Description of the problem; and (6) Copy of the dated purchase receipt. Replacement parts are available through the manufacturer.